Charnock Ridgeway Girls Football Club are currently welcoming new players for the 2018/19 season. Training is every Tuesday after school at our new ground Springs Academy, S12 2SF. Please contact Rachel Gregg for further details (07957 967411). 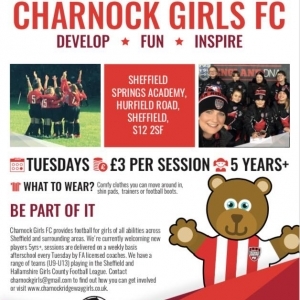 For any general enquiries about our girls teams please check our Facebook Page ‘Charnock Ridgeway Girls FC’ or contact charnockgirls@gmail.com. We are looking for players!